Mr. Jerry Sailor wakes up on a Thursday morning at 9am. Coming out the companionway squinting lightly from the bright morning sun that has burned through the marine layer earlier than usual, he takes a look around the marina. It must be late summer. Jerry’s wearing the same clothes he was the night before. The air is cool but Jerry seems to not be bothered by the fact he’s not wearing a jacket. The docks are quiet and the only movement comes from the light sway of the sailboats and the birds preparing for the day’s hunt. All the other liveaboards have left for work and the rest will not be seen for 2 more days. The marina looks like a painting by a boat admirer that has never set foot on a sailboat deck. Jerry has a nice little Catalina 27 from 1972 named Liza Wee. Mr. Sailor keeps her pretty. He takes good care of her and washes her at least once a week. He tries to mend whatever breaks as soon as it happens. The teak, sheeting lines and sailing gear does not look new or very attractive, but it does look functional, well taken care of and aging properly – kind of like the boat version of Goldie Hawn. Jerry has a simple restaurant job that runs between early afternoon and late night. It’s great, cause it gives him time to enjoy his mornings. Unfortunately, he doesn’t get enough time to sail on working days because by the time the wind starts to show he needs to start getting ready for work. Thursdays however, is his day off. On his days off Jerry goes out and sails. He’s pretty much a lone sailor as during the week most all of the other sailboat owners at the marina are busy surfing (the web), inking documents and preparing spreadsheets for the people that help pay for their expensive boats. After a modest eggs and ham breakfast with a light cup of vanilla flavored drip coffee, Jerry sees some movement overhead. The lines coming down the mast are moving gently but surely and the birds are gliding somewhat easier. It’s getting windy. Jerry begins to set the boat up for a day’s sail. The weather forecast the night before calls for clear skies, 10 knots of wind and 2 to 3 foot surf outside of Oceanside Harbor in North County San Diego. Should be a good day for an easy sail. That is, if the sails on Jerry’s boat hold up. As Jerry unfurls his jib to give it a quick once over, he sees the holes at the foot of the sail are getting bigger. A look at the mainsail reveals the same. Jerry’s sails are simply not going to hold up much longer. He’ll be lucky if they even make it past today. Good thing it’s only blowing 10 knots. Jerry knows these sails won’t hold up for 10 minutes in 20 knot winds. Jerry’s a modest waiter at a local restaurant. It’s not even a high-end restaurant. In fact, it can’t even be considered mid-range. He doesn’t make much money and he knows very well he can’t afford new sails. Most of his spending money goes to fix the less-expensive things that break aboard his Catalina 27. New sails are just too big an expense for Jerry to afford. But what Jerry Sailor doesn’t know is how vast the market is for used sailboat sails. Jerry’s not very proficient on a computer, he doesn’t use the internet for much more than sending an occasional email from the marina’s data center. He doesn’t own a laptop and his phone is an old Samsung flip-phone with a retrievable antenna. If Jerry only knew that there is such a big selection of used sails for sale available on the internet for money even he can afford he wouldn’t be battling with the holes in his current jib and mainsail. What Jerry needs is a friend to tell him about it and where he can buy them. The fact is, there are plenty of used sails available online for just about any type of sailboat. Even if you just need a mainsail or a jib alone, buying one used sail is enough to save quite a bit of money. Many wealthy sailors like to replace their sport boat’s sails as soon as they start showing signs of wear or stretching. Sometimes, it’s people that work for lofts or have access to buying new ones at discounted prices. Sometimes it’s dedicated racers that know that new sails simply make the boat faster. They’ll replace their lightly-used sails, still in pristine condition with brand new ones and the old ones land on the used sails market. If you are not a racer, or simply can’t afford brand new ones, lightly used racing sails are absolutely perfect for just cruising around. And, it’s not only mainsails and jibs. 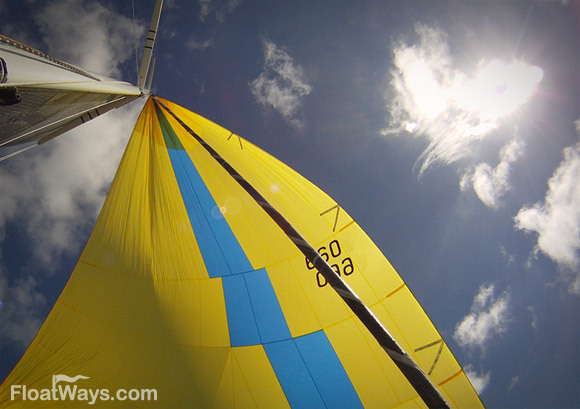 Used sails are also easy to find as spinnakers, genoas, mizzens, drifters, storm jibs and storm tri-sails. In fact, sometimes these types of sails are even easier to find in great condition and excellent prices. Why? While a mainsail and a jib are staple in almost any sailboat, a boat owner will oftentimes buy a storm jib or a spinnaker and end up never using it. Money gets tight and they are the first to go, often at incredibly low prices. If Jerry works a bit more, saves some of his tips and reads this article, he’ll be able to outfit his Catalina 27 with new used sails and be done with it. So, be a friend and share this article with the Jerrys in your life. Jerry will have no more worries with holes in his sails and he can go back to sailing in 20 knots in sheer confidence. That is, in the rare occasion it happens to blow 20 knots in San Diego.